Did you find this tile when you visited the mosaic? Click Here. Welcome to the official Tema Mosaic website. The streaming flash video below left was created by snapping a photograph every 20 seconds during the making of our historical mosaic mural. The kids you see working on this are high school students from Chemu Senior High in Ghana and from Coronado High School in California. Working together for 4 weeks, these student artists were able to create a public art piece that measured 14 feet high by 24 feet wide! 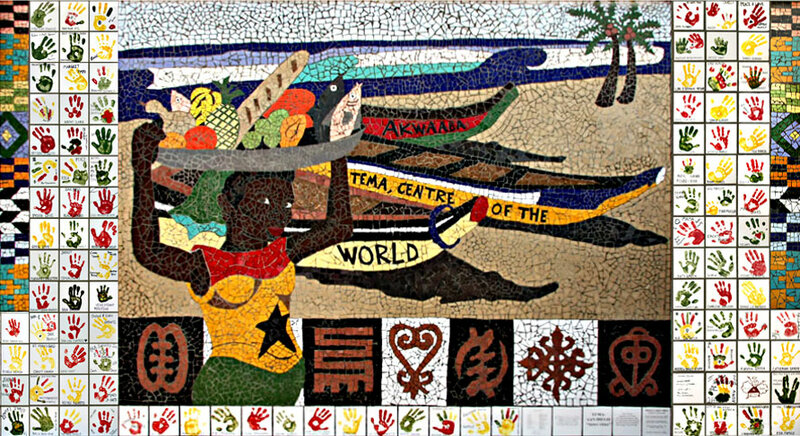 The hand print tiles on either side of the composition are tiles that donors from the US made; lending a 'hand' to our cause and sending a message of goodwill and support across the ocean to our friends in San Diego's Sister City: Tema, Ghana! A big thank you to all the people who made this project possible, both in the US and in West Africa! The Photo Set directly below is on Flickr and is best viewed full screen. Both the Photo Set and Video can be viewed full screen (recommended, expecially for the photo set) by clicking on the expand button at the lower right of each. The image below has hotspots on all the hand print images. Just mouse over them and they'll appear in a window. You can drag the window around by the top or close it by clicking the X in the upper right corner. If you drag a window to a different place and close it it'll remember where you put it if you open it again.